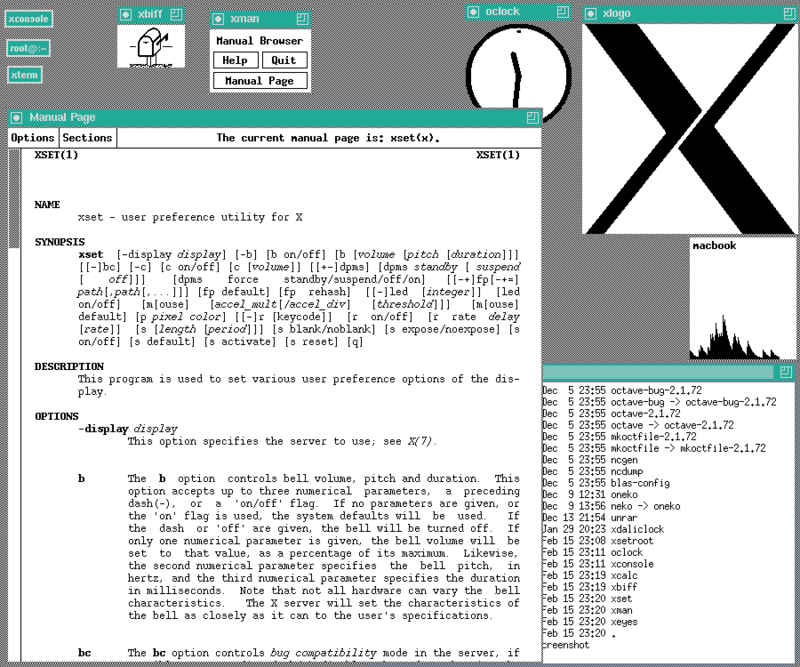 The X window system (commonly X Window System or X11, based on its current major version being 11) is a computer software system and network protocol that provides a basis for graphical user interfaces (GUIs) and rich input device capability for networked computers. It creates a hardware abstraction layer where software is written to use a generalized set of commands, allowing for device independence and reuse of programs on any computer that implements X.
X originated at the Massachusetts Institute of Technology (MIT) in 1984. The current protocol version, X11, appeared in September 1987. The X.Org Foundation leads the X project, with the current reference implementation, X.Org Server, available as free and open source software under the MIT License and similar permissive licenses. X is an architecture-independent system for remote graphical user interfaces and rich input device capabilities which allows many people to share the processing power of a time-sharing computer and to collaborate with each other through client applications running on remote computers. Each person using a networked terminal has the ability to interact with the display with any type of user input device. 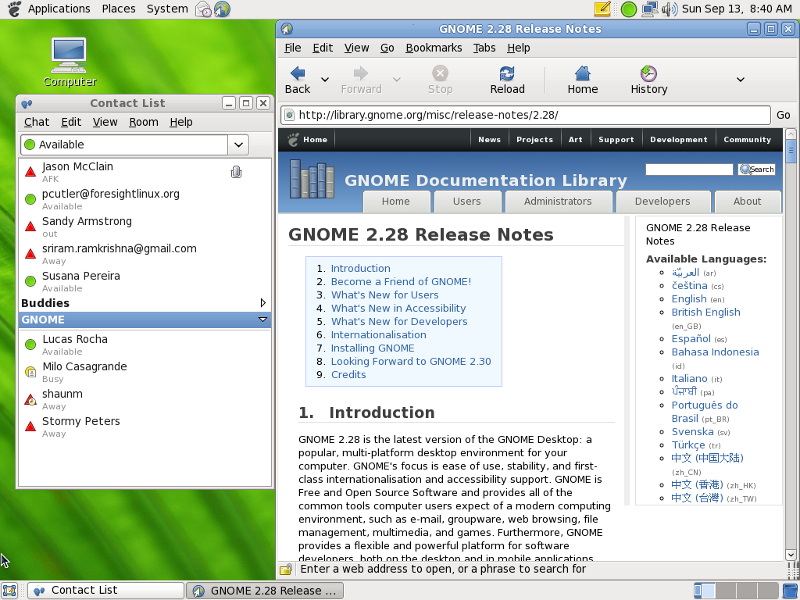 Due to the ubiquity of support for X software on Unix, Linux and Mac OS X, X is commonly used to run client applications on personal computers even when there is no need for time-sharing. X provides windowing on computer displays and manages keyboard, pointing device control functions and touchscreens. In its standard distribution it is a complete, albeit simple, display and interface solution which delivers a standard toolkit and protocol stack for building graphical user interfaces on most Unix-like operating systems and OpenVMS, and has been ported to many other contemporary general purpose operating systems. 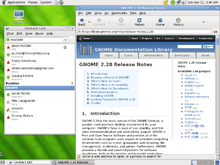 X provides the basic framework, or primitives, for building such GUI environments: drawing and moving windows on the display and interacting with a mouse, keyboard or touchscreen. X does not mandate that the user interface be present — individual client programs known as window managers handle this. The window manager is not necessary and programs may use X's graphical abilities with no user interface. As such, the visual styling of X-based environments varies greatly; different programs may present radically different interfaces. X is built as an additional (application) abstraction layer on top of the operating system kernel. Unlike most earlier display protocols, X was specifically designed to be used over network connections rather than on an integral or attached display device. 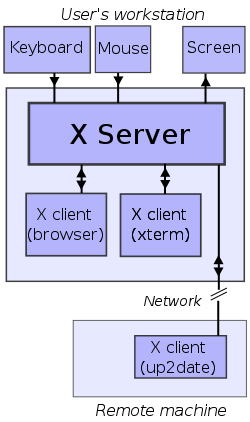 X features network transparency: the machine where an application program (the client application) runs can differ from the user's local machine (the display server). X's network protocol is based on X command primitives and, with GLX, OpenGL 3D primitives rather than on a more basic framebuffer copying paradigm. This approach allows both 2D and 3D operations to be fully accelerated on the remote X server. When used across the network, bandwidth and latency can both be significant issues in the usability of certain software models. Bandwidth is a key factor both in watching video in 2D and in transferring textures for 3D. Latency can be a concern in interactive applications - most obviously games - but for high levels of latency even basic menu manipulation can become difficult. X provides no support for audio, although several projects exist in this niche, some also providing transparent network support. Some are PulseAudio, Advanced Linux Sound Architecture (ALSA), Open Sound System (OSS), and JACK Audio Connection Kit (JACK). X also lacks support for user-defined stored procedures on the X server, which might have allowed for the dynamic construction of higher order primitives as seen in NeWS, which could reduce bandwidth demands from requiring fewer primitives to be sent, and improve certain types of interaction by removing round trips to the remote X client program in some varieties of menu interactions, picking, window management, and so on. X is often used in conjunction with an X session manager to implement sessions. Usually, a session is started by the X display manager. However, the user can also start a session by manually running the xinit or startx programs. a dedicated piece of hardware. This client–server terminology—the user's terminal being the server and the applications being the clients—often confuses new X users, because the terms appear reversed. But X takes the perspective of the application, rather than that of the end-user: X provides display and I/O services to applications, so it is a server; applications use these services, thus they are clients. use ssh with the X forwarding argument to connect to the remote machine. Telnet can be used but is not secure, does not allow graphical forwarding and is largely deprecated. request local display/input service (e.g., export DISPLAY=[user's machine]:0 if not using SSH with X forwarding or 'tunneling' enabled). using a client application to join with large numbers of other terminal users in collaborative workgroups. running graphical software on several machines at once, controlled by a single display, keyboard and mouse. X has largely kept to these principles.The sample implementation is developed with a view to extension and improvement of the implementation, while remaining compatible with the original 1987 protocol. X is primarily a protocol and graphics primitives definition and it deliberately contains no specification for application user interface design, such as button, menu, or window title bar styles. Instead, application software – such as window managers, GUI widget toolkits and desktop environments, or application-specific graphical user interfaces - define and provide such details. As a result, there is no typical X interface and several desktop environments have been popular among users. A window manager controls the placement and appearance of application windows. 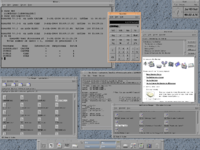 This may result in desktop interfaces akin to those of Microsoft Windows or the Apple Macintosh (examples include Metacity in GNOME, KWin in KDE Software Compilation, Xfwm in Xfce, or Compiz) or have radically different controls (such as a tiling window manager, like wmii or Ratpoison). Window managers range in sophistication and complexity from the bare-bones (e.g., twm, the basic window manager supplied with X, or evilwm, an extremely light window manager) to the more comprehensive desktop environments such as Enlightenment and even to application-specific window managers for vertical markets such as point of sale. 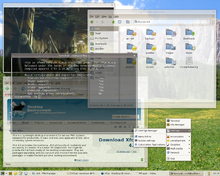 Many users use X with a desktop environment, which, aside from the window manager, includes various applications using a consistent user interface. 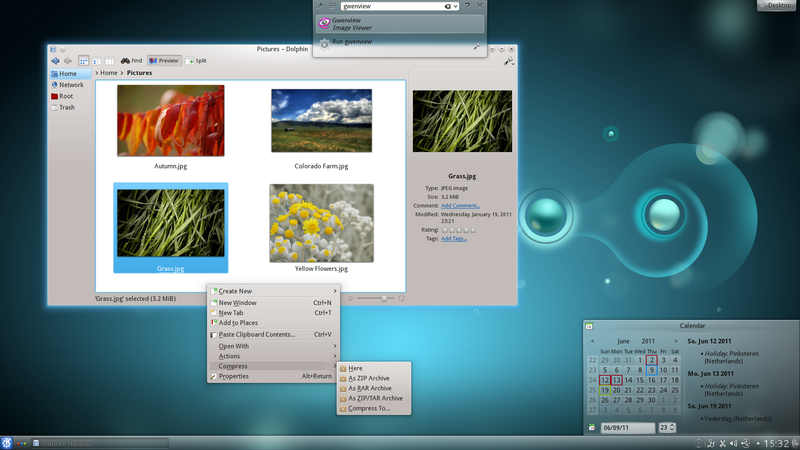 GNOME, KDE Software Compilation and Xfce are the most popular desktop environments. The Unix standard environment is the Common Desktop Environment (CDE). The freedesktop.org initiative addresses interoperability between desktops and the components needed for a competitive X desktop. As X is responsible for keyboard and mouse interaction with graphical desktops, certain keyboard shortcuts have become associated with X. Control-Alt-Backspace typically terminates the currently running X session, while Control-Alt in conjunction with a function key switches to the associated virtual console. However, this detail is left to the design of an X server implementation and is not universal; for example, X server implementations for Windows and Macintosh typically do not provide these keyboard shortcuts. The X.Org implementation serves as the canonical implementation of X. Due to liberal licensing, a number of variations, both free and open source and proprietary, have appeared. Commercial Unix vendors have tended to take the open source implementation and adapt it for their hardware, usually customizing it and adding proprietary extensions. While it is common to associate X with Unix, X servers also exist natively within other graphical environments. Hewlett-Packard's OpenVMS operating system includes a version of X with Common Desktop Environment (CDE), known as DECwindows, as its standard desktop environment. Apple's Mac OS X v10.3 (Panther) and v10.4 (Tiger) include X11.app, based on XFree86 4.3 and X11R6.6, with better Mac OS X integration. On Mac OS X v10.5 (Leopard), Apple included X.org (X11R7.2 codebase) instead of XFree86 (X11R6.8). Third-party servers under Mac OS 7, 8 and 9 included Apple's MacX and White Pine Software's eXodus. Microsoft Windows is not shipped with support for X, but many third-party implementations exist, as free and open source software such as Cygwin/X, Xming (free up to 6.9.0.31) and WeirdX; freeware such as Mocha X Server; and proprietary products such as Xmanager, Exceed, eXcursion (Hewlett-Packard), MKS X/Server, Reflection X, X-Win32 and Xming (current versions). A limitation of X terminals and most thin clients is that they are not capable of any input or output other than the keyboard, mouse, and display. All relevant data is assumed to exist solely on the remote server, and the X terminal user has no methods available to save or load data from a local terminal device such as a floppy disk, CDROM, or USB storage device. However, printing is usually supported as a shared network or serial connection near the terminal. Dedicated (hardware) X terminals have become less common; a PC or modern thin client with an X server typically provides the same functionality at the same, or lower, cost. The lack of design guidelines in X has resulted in several vastly different interfaces, and in applications that have not always worked well together. The Inter-Client Communication Conventions Manual (ICCCM), a specification for client interoperability, has a reputation as being difficult to implement correctly. Further standards efforts such as Motif and CDE did not alleviate problems. This has frustrated users and programmers Graphics programmers now generally address consistency of application look and feel and communication by coding to a specific desktop environment or to a specific widget toolkit, which also avoids having to deal directly with the ICCCM. Systems built upon the X windowing system may have accessibility issues that make utilization of a computer difficult for disabled users, including right click, double click, middle click, mouseover, and focus stealing. Some X11 clients deal with accessibility issues better than others, so those with accessibility problems are not locked out of using X11. However there is no accessibility standard or accessibility guidelines for X11. Within the X11 standards process there is no working group on accessibility, so the known ongoing accessibility problems are probably going to persist into the future. An X client cannot generally be detached from one server and reattached to another unless its code specifically provides for it (emacs is one of the few common programs with this ability). By extension, moving an entire session from one X server to another is generally not possible. However, approaches like Virtual Network Computing (VNC), NX and Xpra allow a virtual session to be reached from different X servers (in a manner similar to GNU Screen in relation to terminals), and other applications and toolkits provide related facilities. Workarounds like x11vnc (VNC :0 viewers) and NX (nxagent's shadow mode) also exist to make the current X-server screen available via VNC and NX respectively. This ability allows the user interface (mouse, keyboard, monitor) of a running application to be switched from one location to another without stopping and restarting the application. This can be important in some applications, such as process monitoring and control. When using X across a network, bandwidth limitations can impede the use of bandwidth-intensive applications. Even a relatively small 640x480x24bit, 30fps video stream, if uncompressed, can easily outstrip the 100Mbit networking commonly in the consumer market in 2010, and is not itself a problem with X. However, early versions of X would suffer even when not using the local network for such applications, due to the network-centric protocol which would still utilize an internal network model within the computer, via localhost or unix sockets. In contrast, modern versions of X generally have extensions allowing local display of a local program's graphics to be optimized to bypass the network model, for performant use of full-screen video, rendered 3D applications, and other such applications. Some people have attempted writing alternatives to and replacements for X. Historical alternatives include Sun's NeWS, which failed in the market, and NeXT's Display PostScript, both PostScript-based systems supporting user-definable display-side procedures, which X lacked. Mac OS X, iOS, and Android are the main Unix-like systems not using X for graphics. When Apple Inc. bought NeXT, and used NeXTSTEP to construct Mac OS X, they replaced Display PostScript with Quartz. Mike Paquette, one of the authors of Quartz, explained why Apple did not move from Display PostScript to X, and chose instead to develop its own window server, by saying that once Apple added support for all the features it wanted to include into X11, it would not bear much resemblance to X11 nor be compatible with other servers anyway. Wayland display server, hosted by freedesktop.org and developed by several X.Org developers, both addresses criticisms of X by replacing it completely and works directly with the hardware via DRI. It is planned for Wayland to eventually replace X in Ubuntu and Fedora, the two most popular Linux distributions. Wayland handles backward compatibility with X by optionally running an X.org server as a client, which can be rootless (having one Wayland window per X client). Other attempts to address criticisms of X by replacing it completely include Berlin/Fresco and the Y Window System. These alternatives have seen negligible take-up and have been abandoned by their developers; commentators widely doubt the viability of any replacement that does not preserve backward compatibility with X. Other competitors attempt to avoid the overhead of X by working directly with the hardware. Such projects include DirectFB. The Direct Rendering Infrastructure (DRI), which aims to provide a reliable kernel-level interface to the framebuffer, may make these efforts redundant. RAWT, IBM's Java-only Remote AWT, which implements a Java "server" and simple hooks for any remote Java client. MicroXwin is not a full-fledged replacement for X but maintains binary compatibility with standard X clients while providing better performance and significantly lower memory overhead by a different architecture of design that directly implements the system as a kernel module. The kernel module is proprietary while the user space libraries, libX11 (counterpart of Xlib) and libXext, are available under BSD style license. Carnegie-Mellon University produced a remote-access application called Alto Terminal, that displayed overlapping windows on the Xerox Alto, and made remote hosts (typically DEC VAX systems running Unix) responsible for handling window-exposure events and refreshing window contents as necessary. 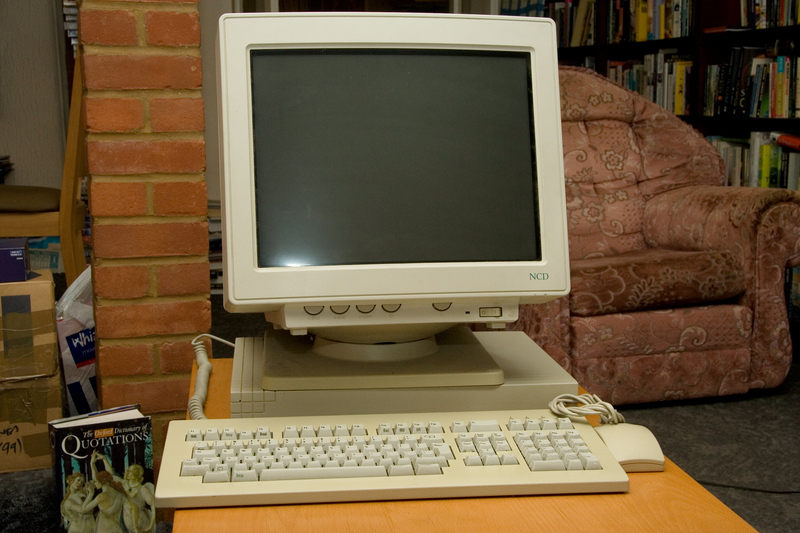 A group at Brown University ported version 9 to the IBM RT/PC, but problems with reading unaligned data on the RT forced an incompatible protocol change, leading to version 10 in late 1985. By 1986, outside organizations had began asking for X. X10R2 was released in January 1986, then X10R3 in February 1986. Although MIT had licensed X6 to some outside groups for a fee, it decided at this time to license X10R3 and future versions under what became known as the MIT License, intending to popularize X further and, in return, hoping that many more applications would become available. X10R3 became the first version to achieve wide deployment, with both DEC and Hewlett-Packard releasing products based on it. Other groups ported X10 to Apollo and to Sun workstations and even to the IBM PC/AT. Demonstrations of the first commercial application for X (a mechanical computer-aided engineering system from Cognition Inc. that ran on VAXes and displayed on PCs running an X server) took place at the Autofact trade show at that time. The last version of X10, X10R4, appeared in December 1986. Attempts were made to enable X servers as real-time collaboration devices, much as Virtual Network Computing (VNC) would later allow a desktop to be shared. One such early effort was Philip J. Gust's SharedX tool. Although X10 offered interesting and powerful functionality, it had become obvious that the X protocol could use a more hardware-neutral redesign before it became too widely deployed, but MIT alone would not have the resources available for such a complete redesign. As it happened, DEC's Western Software Laboratory found itself between projects with an experienced team. Smokey Wallace of DEC WSL and Jim Gettys proposed that DEC WSL build X11 and make it freely available under the same terms as X9 and X10. This process started in May 1986, with the protocol finalized in August. Alpha testing of the software started in February 1987, beta-testing in May; the release of X11 finally occurred on September 15, 1987. In 1987, with the success of X11 becoming apparent, MIT wished to relinquish the stewardship of X, but at a June 1987 meeting with nine vendors, the vendors told MIT that they believed in the need for a neutral party to keep X from fragmenting in the marketplace. In January 1988, the MIT X Consortium formed as a non-profit vendor group, with Scheifler as director, to direct the future development of X in a neutral atmosphere inclusive of commercial and educational interests. Jim Fulton joined in January 1988 and Keith Packard in March 1988 as senior developers, with Jim focusing on Xlib, fonts, window managers, and utilities; and Keith re-implementing the server. Donna Converse, Chris D. Peterson, and Stephen Gildea joined later that year, focusing on toolkits and widget sets, working closely with Ralph Swick of MIT Project Athena. The MIT X Consortium produced several significant revisions to X11, the first (Release 2 - X11R2) in February 1988. Jay Hersh joined the staff in January 1991 to work on the PEX and X113D functionality. He was followed soon after by Ralph Mor (who also worked on PEX) and Dave Sternlicht. In 1993, as the MIT X Consortium prepared to depart from MIT, the staff were joined by R. Gary Cutbill, Kaleb Keithley, and David Wiggins. In 1993, the X Consortium, Inc. (a non-profit corporation) formed as the successor to the MIT X Consortium. It released X11R6 on May 16, 1994. In 1995 it took on the development of the Motif toolkit and of the Common Desktop Environment for Unix systems. The X Consortium dissolved at the end of 1996, producing a final revision, X11R6.3, and a legacy of increasing commercial influence in the development. The Open Group released X11R6.4 in early 1998. Controversially, X11R6.4 departed from the traditional liberal licensing terms, as the Open Group sought to assure funding for the development of X. The new terms would have prevented its adoption by many projects (such as XFree86) and even by some commercial vendors. After XFree86 seemed poised to fork, the Open Group relicensed X11R6.4 under the traditional license in September 1998. The Open Group's last release came as X11R6.4 patch 3. By 2003, while the popularity of Linux (and hence the installed base of X) surged, X.Org remained inactive, and active development took place largely within XFree86. However, considerable dissent developed within XFree86. The XFree86 project suffered from a perception of a far too cathedral-like development model; developers could not get CVS commit access and vendors had to maintain extensive patch sets. In March 2003, the XFree86 organization expelled Keith Packard, who had joined XFree86 after the end of the original MIT X Consortium, with considerable ill-feeling. The Foundation takes an oversight role over X development: technical decisions are made on their merits by achieving rough consensus among community members. Technical decisions are not made by the board of directors; in this sense, it is strongly modelled on the technically non-interventionist GNOME Foundation. The Foundation employs no developers. The Foundation released X11R6.7, the X.Org Server, in April 2004, based on XFree86 4.4RC2 with X11R6.6 changes merged. Gettys and Packard had taken the last version of XFree86 under the old license and, by making a point of an open development model and retaining GPL compatibility, brought many of the old XFree86 developers on board. X11R6.8 came out in September 2004. It added significant new features, including preliminary support for translucent windows and other sophisticated visual effects, screen magnifiers and thumbnailers, and facilities to integrate with 3D immersive display systems such as Sun's Project Looking Glass and the Croquet project. 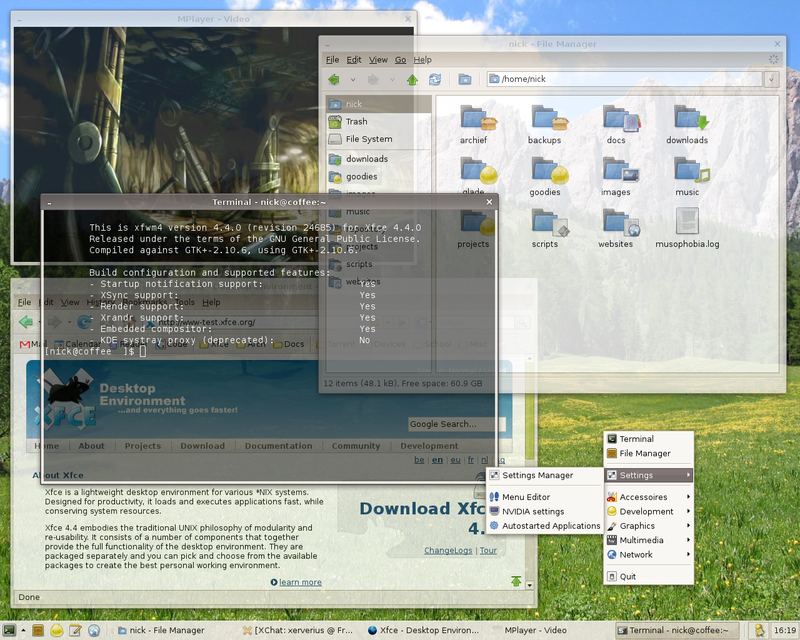 External applications called compositing window managers provide policy for the visual appearance. On December 21, 2005, X.Org released X11R6.9, the monolithic source tree for legacy users, and X11R7.0, the same source code separated into independent modules, each maintainable in separate projects. The Foundation released X11R7.1 on May 22, 2006, about four months after 7.0, with considerable feature improvements. On the other side, XFree86 is still being developed at a very slow pace, and version 4.8.0 was released on 15 December 2008. The X.Org Foundation and freedesktop.org managed the main line of X development and they intend to provide more access to ubiquitous 3D hardware features. For sufficiently capable combinations of hardware and operating systems, X.Org plans to access the video hardware only via the Direct Rendering Infrastructure (DRI), using the 3D hardware. The DRI first appeared in XFree86 version 4.0 and became standard in X11R6.7 and later and this work is ongoing. People in the computer trade commonly shorten the phrase "X Window System" to "X Window", "X11" (for version 11, used since 1987) or simply to "X". The term "X-Windows" (in the manner of "Microsoft Windows") is not officially endorsed, though it has been in common use since early in the history of X and has been used deliberately for provocative effect, for example in the UNIX-HATERS Handbook. X1 June 1984 First use of the name "X"; fundamental changes distinguishing the product from W.
X6 January 1985 First version licensed to a handful of outside companies. X9 September 1985 Color. First release under MIT License. X10R3 February 1986 First freely redistributable X release. Earlier releases required a BSD source license to cover code changes to init/getty to support login. uwm made standard window manager. X10R4 December 1986 Last version of X10. X11 September 15, 1987 First release of the current protocol. X11R2 February 1988 First X Consortium release. X11R4 December 22, 1989 XDMCP, twm brought in as standard window manager, application improvements, Shape extension, new fonts. X11R6 May 16, 1994 ICCCM v2.0; Inter-Client Exchange; X Session Management; X Synchronization extension; X Image extension; XTEST extension; X Input; X Big Requests; XC-MISC; XFree86 changes. X11R6.1 March 14, 1996 X Double Buffer extension; X keyboard extension; X Record extension. X11R6.3 (Broadway) December 23, 1996 Web functionality, LBX. Last X Consortium release. X11R6.2 is the tag for a subset of X11R6.3 with the only new features over R6.1 being XPrint and the Xlib implementation of vertical writing and user-defined character support. X11R6.4 March 31, 1998 Xinerama. X11R6.5 Internal X.org release; not made publicly available. X11R6.6 April 4, 2001 Bug fixes, XFree86 changes. X11R6.7.0 April 6, 2004 First X.Org Foundation release, incorporating XFree86 4.4rc2. Full end-user distribution. Removal of XIE, PEX and libxml2. X11R6.8.1 September 17, 2004 Security fix in libxpm. X11R6.8.2 February 10, 2005 Bug fixes, driver updates. X11R7.0 December 21, 2005 EXA, major source code refactoring. From the same source-code base, the modular autotooled version became 7.0 and the monolithic imake version was frozen at 6.9. X11R7.1 May 22, 2006 EXA enhancements, KDrive integrated, AIGLX, OS and platform support enhancements. X11R7.2 February 15, 2007 Removal of LBX and the built-in keyboard driver, X-ACE, XCB, autoconfig improvements, cleanups. X11R7.3 September 6, 2007 XServer 1.4, Input hotplug, output hotplug (RandR 1.2), DTrace probes, PCI domain support. X11R7.4 September 23, 2008 XServer 1.5.1, XACE, PCI-rework, EXA speed-ups, _X_EXPORT, GLX 1.4, faster startup and shutdown. X11R7.5 October 26, 2009 XServer 1.7, Xi 2, XGE, E-EDID support, RandR 1.3, MPX, predictable pointer acceleration, DRI2 memory manager, SELinux security module, further removal of obsolete libraries and extensions. X11R7.6 December 20, 2010 X Server 1.9, XCB requirement. X11R7.7 2011 Xorg server 1.10 changes; RandR extension 1.4; Sync extension 1.3. X11R7.8 2012 Xi 3; XKB 2.